According to the education levels described by the PDC, this continuing education course is considered to be Essential Level, and is appropriate for all athletic trainers. Although most athletic trainers deal with patients who are in pain, very few clinicians understand the complexity of pain perception and the individuality by which it presents itself from patient to patient. Often, patients of the same gender, around the same age, with the same diagnosis, present very differently when it comes to the amount of pain they are experiencing. This presents a difficult scenario for the athletic trainer, who may be utilizing past clinical experience to manage a current patient. Truly understanding the biopsychosocial aspects of pain and understanding the most recent literature on pain sciences will be helpful to the clinical athletic trainer, who is often tasked with helping a patient simply “feel better”. Pain affects movement, so athletic trainers who are attempting to change an athletes’ movement patterns first must address the pain perception that can be altering the movement patterns. Proper modality selection and counseling is a must in order for the athletic trainer to be effective in the field of pain management. Describe reasons why pain presents differently in each patient, even in patients who present with the same diagnosis. Discuss the biopsychosocial aspects of pain. Identify common modalities that are effective for pain modulation. Discuss the mechanisms by which these common modalities potentially work. According to the education levels described by the PDC, this continuing education course is considered to be Advanced Level, and is appropriate for all athletic trainers. Although many athletic trainers use clinical practice guidelines, position statements, and consensus statements to identify best practices for the management of various illnesses and injuries, fewer understand the differences between these types of documents and the development process for these documents. This course aims to differentiate between clinical practice guidelines, position statements, and consensus statements and describe the process of how these documents are develop. Using the published documents regarding sport-related concussion, examples between the similarities and differences in recommendations made among these documents will be illustrated. Specifically, focus will be on similarities and differences in diagnosis, prevention, assessment, management, and the use of neurocognitive testing. A discussion of the historical changes in recommendations from Vienna and the 2004 NATA statement through the 2014 NATA statement and the recently released Berlin consensus statement will also be included. Describe the development process for clinical practice guidelines. Differentiate between types of clinical practice guidelines. Discuss the process used to develop the Berlin concussion consensus statement. Identify best practices according to the Berlin concussion consensus statement. Compare recommendations from various statements and guidelines for use in clinical practice. This course provides athletic trainers with a foundation for clinical outcomes assessment that highlights the benefits of their collection and strategies for successful implementation in clinical practice. The concepts and principles essential to the fundamental understanding of clinical outcomes assessment related to patient care (eg, disablement models, clinician-/patient-rated outcomes, generic/specific patient-rated outcomes) are included. Commonly used patient-rated outcomes instruments are presented. Additionally, strategies for implementation (eg, simple, complex, patient-centered) into routine clinical practice are introduced. Appreciate the benefits of routine evaluation of patient-rated outcome measures as it pertains to patient-centered whole person healthcare, evidence-based practice, and driving treatment decisions. Define and describe fundamental concepts of clinical outcomes assessment including disablement models, clinician vs. patient-rated outcomes, generic vs. specific patient rated outcome measures, and single and multi-item patient-rated outcome measures. 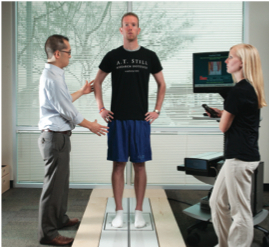 Identify commonly used patient-rated outcome measures for use in athletic populations. Implement strategies to evaluate patient outcomes in clinical practice. Discuss the value of using outcomes data collection for professional advancement. This course discusses the role of athletic training within the current healthcare system and the important role of practice-based research to improve the effectiveness of healthcare delivery and patient outcomes. At the point-of-care, clinicians can utilize the patient-oriented assessment model to gather data to aid in clinical decision-making and for supporting comparative effectiveness of athletic training services. Working collaboratively to engage in comparative effectiveness efforts can improve patient outcomes, and add to the body of evidence, specific to the athletic training profession. While the role of HIT and healthcare informatics in assisting in fundamental tasks of evidence-based practice (e.g., searching the literature and managing knowledge) is well-recognized in athletic training, more advanced utilization of HIT and healthcare informatics is not as prominent. Despite the importance of the HIT and healthcare informatics, athletic trainers may lack the appropriate knowledge and strategies to effectively implement the use of HIT and healthcare informatics during routine clinical practice. Therefore, the purpose of this 2-hour module is to introduce the concepts associated with more advanced usage of HIT and healthcare informatics in athletic training clinical practice. This course provides an overview of evidence-based practice and is designed to enable the athletic trainer’s clinical decision-making process in a manner that integrates clinical experience, patient values, and the best available evidence. This course will assist in providing the athletic trainer with strategies to enable them to search and appraise the evidence in a more succinct and timely manner, that will promote better patient care. Describe the role of EBP in healthcare. Identify strategies to efficiently search the literature. Describe common concepts that are assessed during critical appraisal of published research studies. Evaluate the levels of evidence or strength of recommendations of research articles. Discuss the integration of the best available evidence into clinical practice. Appreciate patient values with respect to clinical decision-making. A.T. Still University is recognized by the Board of Certification, Inc. to offer continuing education for Certified Athletic Trainers. Among the first programs of its kind, A.T. Still University’s (ATSU) Doctor of Athletic Training (DAT) degree develops clinical and academic leaders who advance the athletic training profession. Doctors of Athletic Training serve as expert clinicians, educators, and administrators with advanced knowledge and skills for analyzing, developing, and implementing practical solutions to improve the delivery of athletic healthcare and the health outcomes of physically active individuals and their communities. ATSU’s online athletic training degree is designed for those who seek a doctorate in athletic training and desire a terminal degree in athletic training, not a terminal academic degree (i.e. PhD) in another area with a concentration in athletic training. Most athletic trainers who are best fit for this advanced online athletic training degree are elite clinical, educational and industry professionals who gain a powerful educational benefit as students embedded in a work setting while progressing through the curriculum. Educators are prepared with the advanced graduate training needed to effectively teach their own students to succeed as athletic trainers. Instructors for these courses report no financial or non-financial disclosures. Cancellation/refund policies for these courses follow the ATSU University policies for refunds related to course work. Students are referred to the university handbook for these policies. The Graduate Certificate in Clinical Decision-Making in Athletic Training is an online program providing advanced instruction in evidence-based practice, clinical outcomes assessments, clinical informatics and technology, and epidemiology. The purpose of the program is to prepare practicing athletic trainers and athletic training educators with the clinical practice and educational competencies in clinical decision-making skills that will enhance the quality and effectiveness of patient care. The Graduate Certificate in Orthopedic Rehabilitation is an online Athletic Training program designed to provide advanced instruction in orthopedic basic science, surgical considerations for orthopedic rehabilitation, assessment of movement dysfunction, and corrective techniques for movement dysfunction. The purpose of the Graduate Certificate in Orthopedic Rehabilitation is to provide advanced knowledge and skills in the field of orthopedic rehabilitation.